Heavy smoke poured from an upstairs room of this house at 16 Marc Street Tuesday afternoon while firefighters on the scene were delayed in being able to get water to the house. In an original post yesterday evening, we mistakenly reported that firefighters responding to a blaze in an upstairs room at 16 Marc Street were delayed up to half an hour getting water on the fire. The Reporter regrets the error. AMBROSE CLANCY PHOTO | The aftermath of a fire on Penny’s Path that originated from a portable generator on Saturday afternoon. 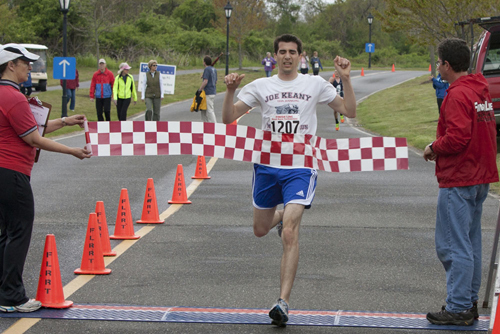 KATHARINE SCHROEDER PHOTO | Bryan Knipfing of Shelter Island Heights won the May Mile 5K in Greenport Saturday morning in 17 minutes 57 seconds. For the eighth consecutive year, Peconic Landing celebrated Older Americans Month with a May Mile and 5K race/walk on Saturday morning in Greenport. Despite predictions of stormy weather, hundreds turned out for the event, which benefits the Greenport Fire Department. Shelter Island Heights resident Bryan Knipfing crossed the finish line first with a time of 17 minutes 57 seconds in the 5K. 10-year-old Tommy Vine of Brooklyn was the first female finisher in 22:41.